Four different sizes. 1 t, 2 t, 3 t and 5 t.For insertion and extortion of eg. bushings, shafts, etc. The stand is made of cast iron, a rack and rounded steel. Strong hydraulic press. Power: 30 tons. 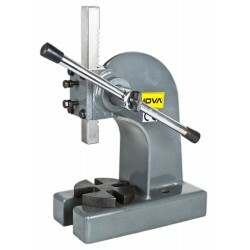 Heavy-class press for professional heavy-duty use. 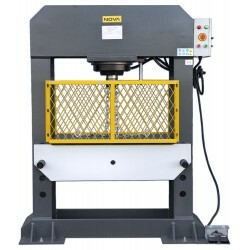 Pneumatic 50 ton hydraulic press. No need for hand pump. 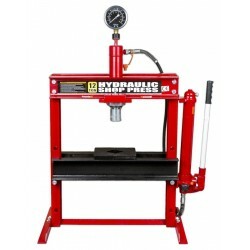 Hydraulic presses for hard work. 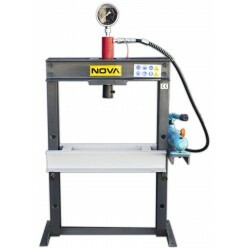 High quality and durable designs for work shops and other metal professionals. 30 tons of compression force with a 3 kW motor. 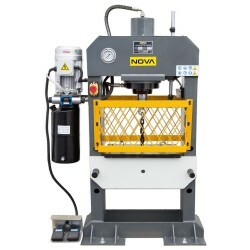 Electric hydraulic press. Press power is 50 tons. 3 kW motor. Piston movement is 220 mm. 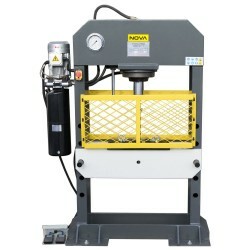 Powerful 100 ton hydraulic press with 3 kW motor. Piston movement is 250 mm. In this model hydraulic lift for the table.